Its hard to believe that in 1959 the car was built just as we know it today. This was the first car with a front wheel drive, transverse engine mounted in the front, and was also innovative in that it was the only car in the world at that time to have suspension formed not from steel springs, but from a rubber spring system, devised by Alex Moulton (a great suspension designer and bike designer) with Issigonis during his time at Alvis. The Mini had now arrived! The Mini set the scene for nearly all front wheel derived cars this year and that is just one of its many amazing design features in 1959. 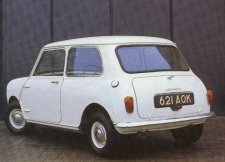 In 1959 , the mini was first launched as the "Austin Se7en", and the "Morris Mini Minor". The first type, a van, was launched in 1960, with a pick-up version launched in 1961. 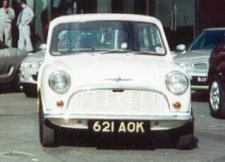 The van lead to the "Morris Mini Minor Traveller" (also known as the "Austin Se7en Countryman"), or the "Woody", as it is usually known today. 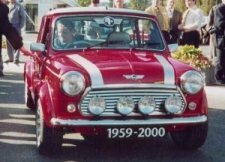 Also in 1961, the first Cooper was produced. Later, in 1963, the Cooper's engine was changed from 997cc to 998cc, making it smoother, and much more torquey. More importantly, the 1071cc Cooper S arrived in March of the same year. No one will forget the Cooper from the 60's or the 90's. Next, in 1964, the S engine range was totally revamped, with new 970cc and 1275cc blocks arriving on the scene. The more important of these was the 1275, which produced an impressive 79 lb ft at 3000 rpm. The 970 lasted until 1965, but the 1275 survived until 1971 in Mk2, and then Mk3 guise. The 970cc Cooper was exceptionally revvy due to the short stroke engine. A grand total of 40,652 were built. The only other Mini variant to be produced under the BMC logo was the Mini-Moke, a jeep like vehicle originally designed for the armed forces. Many other variants were being produced at this time, by assembly plants worldwide, particularly by the Italian firm Innocenti, and in South Africa and Australia. Now under the British Leyland logo, in 1967 the mini received it's first major revamp, with a wider rear windscreen, revised rear light clusters, and a new grille being the major cosmetic differences. These are now very rare and tend to be lovingly restored and used in the summer for fun. In 1969, the Mini Clubman was launched. It had a restyled and longer bonnet, a new dashboard, and, new for Minis, wind up front windows. The Mini estates were replaced by the the Clubman estate, a car renowned for it's rust problems. Importantly though, the Cooper and Cooper S were axed to give way to the 1275GT, with a single carb, 59bhp engine. Today the Mini has changed very little over the past 41 years. But now production has finished and the Mini is now a classic car - not a production car. 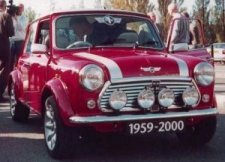 It was bound to come as EU regulations made it even harder to produce the Mini (and BMW influence) - hence the need for airbag, door beams and twin point injection in 1997. Not many cars have stayed the same shape for 41 years and some bits were even made using the same tooling from 1959! Everybody knows the Mini, many grew up with them and they will never be forgotten. Long live the Mini and lets keep it going for another 41 years.